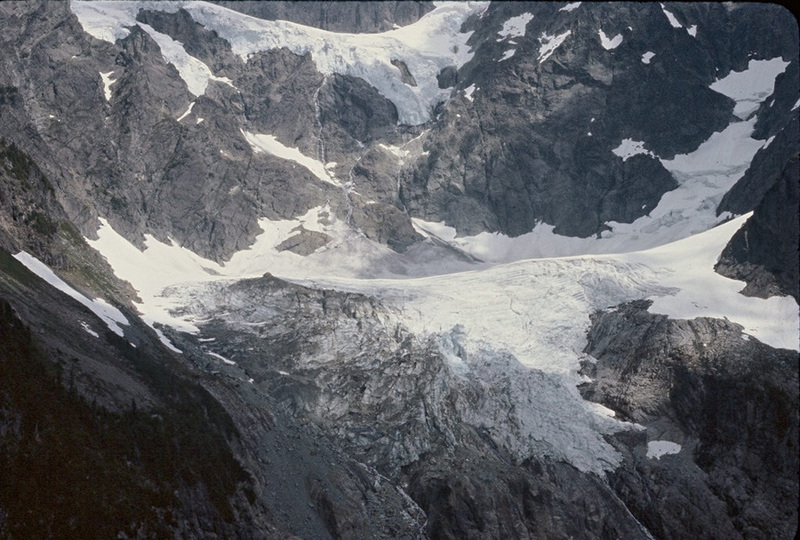 Lower Curtis Glacier fills a spectacular cirque on the south side of Mount Shuksan. 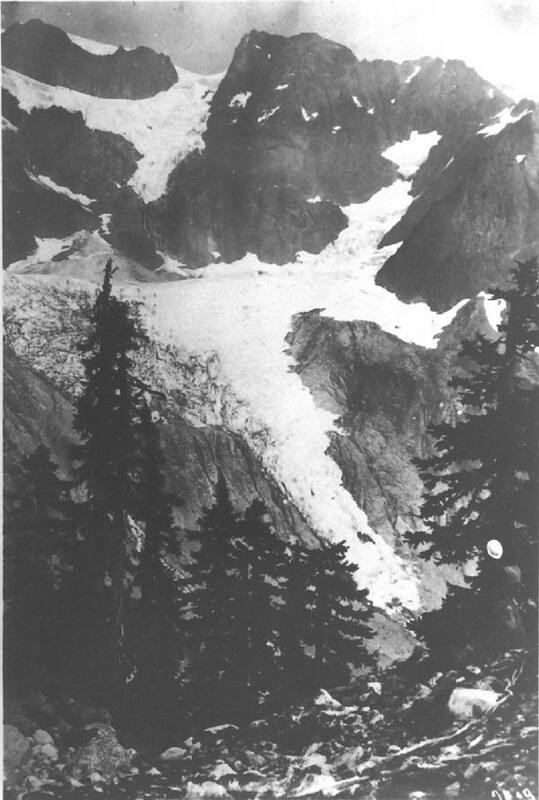 From Lake Ann all but the 1967 image illustrate the changes in the glacier. 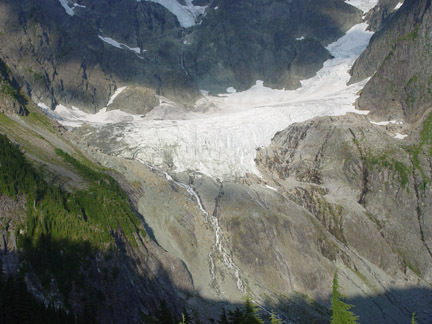 It is fed from above by avalanches off of the Upper Curtis Glacier and the walls of Shuksan. 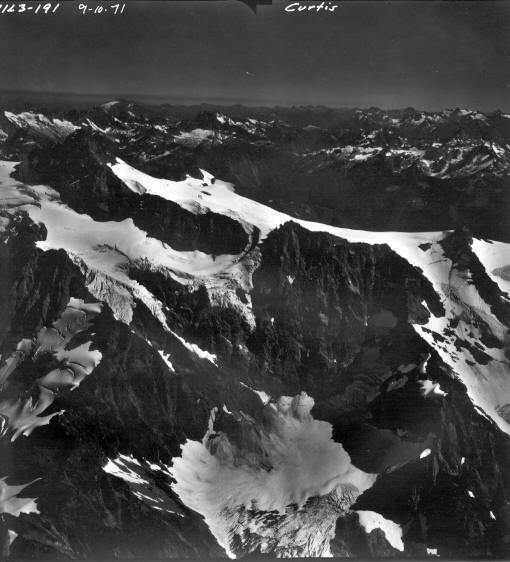 The glacier retreated into the cirque by the 1930’s. In 1950 the glacier began to advance, down the steep slope below the cirque lip. The advance ended in 1986, and retreat has resumed. The glacier has retreated 184 meters from its 1986 position and 600 meters from its 1908 position. 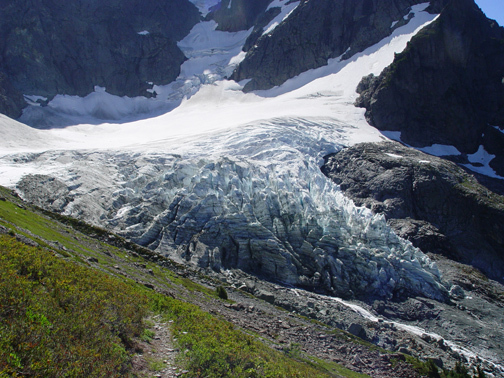 The glacier displays a magnificent set of annual layers in its terminus tongue. The terminus tongue is a spectacular wall of seracs that quickly rises 55 m above the bedrock. There are typically 50 layers visible indicating that this most of the ice in the glacier is 50 years of less in age. A longitudinal profile up the middle of the glacier indicates that it thinned 30 meters from 1908-1984 and 15 m from 1984-2012. Because of its heavy accumulation via avalanching the glacier moves rapidly and is quite crevassed at the terminus. Each year we survey the terminus location, measure the mass balance and survey the glacier surface elevation on a cross profile. The terminus seracs have diminished in steepness and in height since 2014. Lower Curtis Glacier in 1908 (Asahel Curtis). the glacier flowed out of the cirque and down into the valley below. 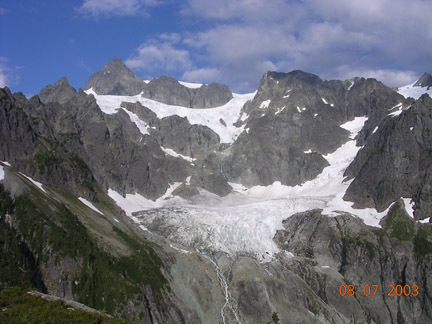 Lower Curtis Glacier in 2005 (below) contrast to the 1988 image (above). Crevassing is reduced and the glacier has thinned both laterally as well as retreated. 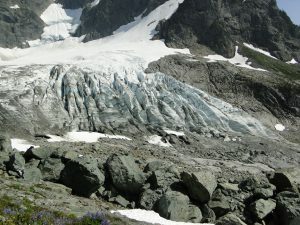 At right in profile in 2004 with recently deglaciated terrain in front of the glacier.